Part 5: Welcome to Raffles! It was 0130. I had decided to give the ‘birthday boy’ an extra half hour before waking him for his watch, since he had slept in the salon during Noen’s inaugural 7-10 PM watch. I had just taken my standard walk-around observation: I noted the lights of the village to our port on the northeast tip of the Indonesian island of Bali, eight miles away now. I updated the log book with our position, compass course, and weather conditions. All was well. Then I pulled out a package Arnott’s TimTams, Double Coat, our favorite munchy while on passage. I set one aside to eat, and put the remainder into the Snack Box on the galley counter. My mind wandered to the special birthday party we would have for Gunter and Noen around toward sundown. Gunter’s birthday is on the 9th, Noen’s on the 10th. All of a sudden, I noticed that the computer screen was dark. “Just the screen saver,” I thought as I went to the nav station. Oops! Our electronic chart had lost its GPS input, and all our nav was out! Ray, our autopilot, had gone to sleep too! I called to Gunter, “Wake up. Urgent. No electrical.” Then I rushed outside to grab the helm. Without instructions from Ray, Pacific Bliss was already turning 180º into the wind, sails flapping wildly. As I turned her back on course, using the lights of Simpatica to my starboard and the Bali village to my port as a rough guide, Gunter came out to the cockpit and turned on both engines for steerage. I checked the last compass course and he set about troubleshooting. My thoughts turned to the possibility of hand steering all night, but with three of us, we could do it. We would do two hours each instead of three. In the light of day, I was confident that Gunter would figure out the problem. I was just putting in a plea UPSTAIRS for wisdom when Gunter had everything solved. This time, it seemed that everything was ON before God had time to enlist His angels! It was a simple and quick fix: a fuse had blown, the one we had substituted after the power spike at the Bali International Marina. I praised the birthday boy and sent him back to bed. We left the marina at high noon yesterday, following the advice of Jimmy Cornell in World Cruising Routes: “Bearing in mind the distances involved, a good tactic is to leave Benoa around noon, so as to pass WP IT111 (8º24’S, 115º47’E) before nightfall, cross the Bali sea at night, and arrive a WP IT112 (7º03’S, 114º53’E) the following morning.” He advised cruisers to leave Benoa at slack water to avoid the strong currents in the Bali-Lombok strait. We’d had a big dose of going against those currents coming into Bali; we didn’t want more of the same on the way out. So the two buddy boat Captains, Wences on Simpatica and Gunter on Pacific Bliss, planned for the ideal departure: slack water was due at noon Thursday. The plan was to sail between Goagoa Island and Karang Takat Reef during the daylight, passing through all the fishing boats we expected to be there. Simpatica had experienced a Reef Encounter leaving the fishing village of Riung, disabling their sail drive. A replacement drive had arrived in Bali, but instead of beaching their cat on the mud flats near the marina during low tide—under time pressure and with inexperienced help—Gunter had persuaded Wences to have the new drive installed in Singapore. Raffles Marina has a haul-out facility and experienced marine mechanics. 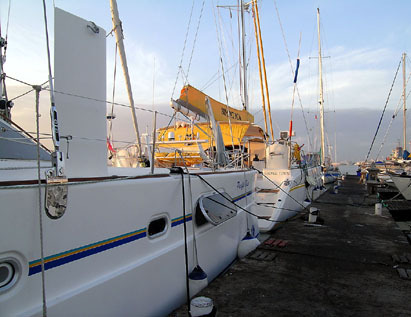 The day began with a wonderful sunrise over the two Catana Cats docked side by side at the end dock of Bali Marina. It was a good omen. The waves were strong, slapping against our hulls as we exited through the reefs at Bali and sailed along the reef at Sanur Beach, but they lessened as we headed north. We hugged the coastline all the way, about 2-3 nautical miles offshore. Even with high boat speeds, our engines struggled to make 2.5 to 3.5 SOG (speed over ground). Once we were free of the Strait, we sailed on through the night at a nice clip, making up for lost time, at 7-9 SOG, with a southeast wind blowing 16-25 knots at Force 5 to Force 6. The wind was unusual for Indonesian waters, which were usually calm at night. It was a great time for training in new crew. Noen, a consultant to the SailAsia Rally, listened carefully and learned fast and well. It would be his birthday on September 10th. We would celebrate both together. He had always wanted to have a birthday at sea, he had informed me. I wanted to make it special. And it was. We began the birthday party with champagne and appetizers: sardine-pickle dip—Gunter’s favorite—mussels and crackers, and cheese. The sun cooperated, setting wonderfully as I brought out two gift bags, one for Gunter and another for Noen. Gunter opened his first, to find some shirts, fast-dry swim trunks, 2 pair of shorts, and an IOU card for an iPOD and shirt-pocket-size digital camera in Singapore. Noen received a bottle of champagne to save for arrival and two San Diego T-shirts. We went up to the pulpit seats to watch the last of the sunset, hazy red, a nice and easy landing into the sea. Afterwards, I served a dessert of chocolate mousse. The crew of Simpatica, sailing alongside, called on the VHF to wish the birthday boys well. But all good things must end, and on Pacific Bliss, they seem to end quickly. The mellow glow of champagne et mousse was shattered as soon as darkness fell. Hundreds of lights, it seemed, flickered as far as we could see, with even more appearing over the horizon. The fishing fleet that was supposed to be back at the islands, thirty miles back, was now coming home. We’d met that fleet, all right. At night! A few boats had red and green navigational lights; most had only white. By the time of the first watch, we counted over 30, with more coming. The concern Captain Gunter had was whether they had nets between them. Noen hailed the lead boat on VHF, Channel 16 and talked with its skipper in Indonesian. Only the lead boat and the sweep boat at the very end of the fleet had VHF, Noen explained after the call. But they had no nets out between them. It took 1 ½ hours for Pacific Bliss to pass through the fleet, most of them crossing our bow, and leaving to port. The three of us stayed up for the first night watch. But that wasn’t all. During my 10-1 watch, another fleet of about a dozen boats crossed our path, this time appearing to head for the larger island of Madura. Our watches were quite busy. We would watch outside at the helm, then come inside to check on the radar. My fear was inadvertently colliding with one of them. But they seemed to part out of the way—as if by osmosis—as Pacific Bliss sailed on through the night.